The 20th edition of BuskerBus will take place between August 19th to 28th, 2016. The first BuskerBus stop will be Wrocław, followed by Zielona Góra, Zgorzelec and Krotoszyn. Sunny jazz of 20’s and 30’s performed by members of legendary Czech “Original Prague Syncopated Orchestra”. Adéla Zejfartová is a Czech singer and actress and her love to the „sunny” music led her to that orchestra,where she performs up to the present day and where she met other musicians, who feel amazed by old music. 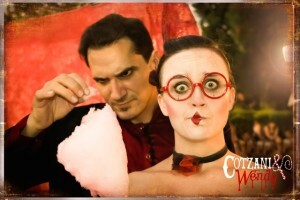 At Busker Bus festival Adéla will be accompanied by ‘Sunny Swing Trio’, which they established in 2012. 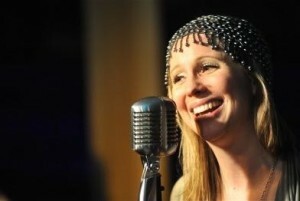 You can hear their interpretation of the most famous songs of golden jazz and beginning swing era. Ariane feels at home on the street. You can tell: she brought half her living room: a chair, a table, a carpet and balls. Many balls. As a circus artist she does not only reat in her living room, but balances on her hands and juggles with her feet. And the audience is invited to join. 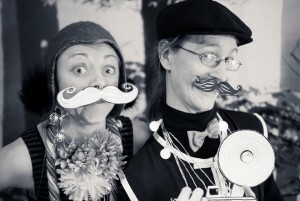 Two crazy pirates and clowns share their stories about sea adventures. They invite children to participate in their world filled with colourful balloons. Characters and props are created in front of the children. 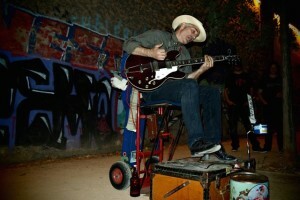 Blues, Jazz, Ragtime, Gospel, Soul and related genres sung and played by a sitting down-style one-man-band. Boris Voutsinos returns to BuskerBus with vocals, guitar, mandolin, harmonica, kazoo and percussion, all packed in a 1920 stylish steamer trunk on a handcart. “The Blazed up Fire Show” is a Futuristic Dark and high energy Fire Ninja style performance of Chris Blaze. His character looks very similar to the lead actor from Assassins Creed. 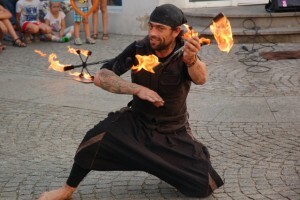 His object is to create dynamic of music acrobatics and fire to deliver a special effect never seen before. Clap Clap Circo is a duo formed by Joaquin Caride- clown and juggler from Argentina and Irene Carrier- actress and circus performer from Uruguay. They performed at BuskerBus in 2014 and they are coming back with their original show “Gulp” full of hula hoop, juggling, fake-magic and a lot of humor. 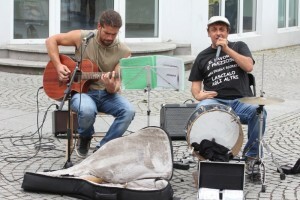 Italian duo returns to BuskerBus with powerful Blues that will move your feet. 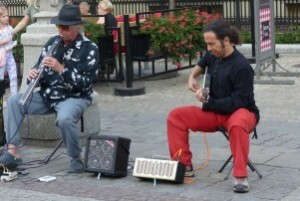 They will impress you with catchy harmonica performance (Dodo) and energetic guitar (Giordy). Ey Pacha! Excéntrico Musical: An excellent and elegant chamber musician will give a concert. But it will be difficult, somewhat eccentric inside him will make impossible the task. 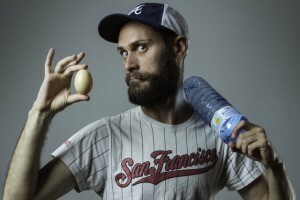 A multidisciplinary one-man variety show in which live music, magic, beatbox, clown, puppets and sawplaying is performed by the same eccentric character. Henrik is a BuskerBus veteran.This time he’s coming back with Ricardo that you had a chance to meet last year. They play electroacoustic music, guitar and electronic wind instruments with roots in the Mexican/African music and a touch of the nordic sky. From a small village near Stonehenge in Wiltshire, England Ian Deadly now works and trains in Turin, Italy. 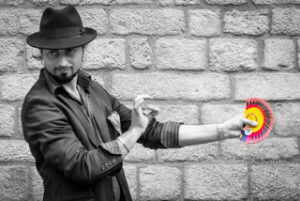 He is a literature and philosophy graduate, circus school graduate, juggler, actor, one-time flying trapese catcher, acrobat, mime and above all; street performer. For the last ten years his only paycheck has been his hat. 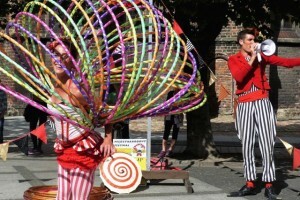 Ian believes that a streetshow starts with two elements: the audience and the performer but finishes as one multi-limbed comic circus octopus, woven inseprably together. 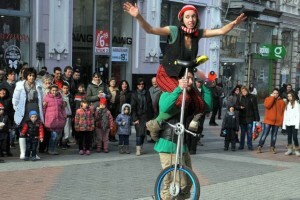 The circus troupe “Igrachka- Plachko” is a project of two clowns from Bulgaria. During their show audience will be amazed by the mix of circus skills such as juggling, acrobatics and riding monocycle as well as humor. The artists would compete with each other but one of them is determined to always win even if that means cheating. They invite children and their parents to enter the fascinating world of circus. 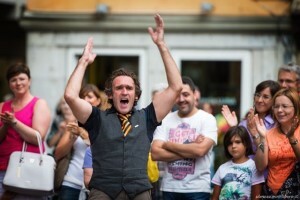 “A fuego lento”: A street show that binds the juggling and the cooking worlds together. 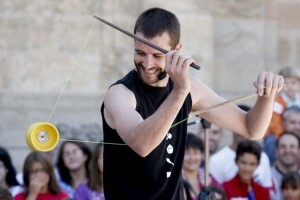 Juggling with the diabolo (Chinese Yo-yo), fire devil sticks, or sword, a ball and a chainsaw, are presented as different dishes of a very special menu. The audience involvement is essential to the show so don’t be surprised if you are invited to assist him. 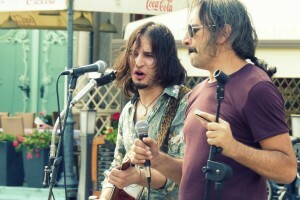 The Light Chili duo is the electro-acoustic emanation of Bad Chili, a Southern Italian rock/blues band. Through the sound of harmonica, slide guitar, carton suitcase, vocals and other surprises, Domenico & Fabrizio Canale (father & son) will take the audience in a journey into the Blues. Now a great reunion awaits the duo this summer, after Fabrizio spending several months in Australia (2015/16) where he spent time with Chris Blaze McCarthy (Fractafire) producing a musical/fire show with. His whole life is centered around theatre. He studied at the Drama School and the School of Theatre Anthropology “El Baldio Teatro” of Buenos Aires. After moving to Spain in 2007, he focuced on his artistic path as claun. At BuskerBus he will play the baseball match. The show is almost ready to start, Martin Sky just needs your participation. Would you take up the challenge? 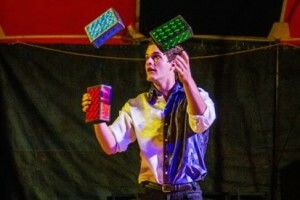 Matthias delivers an action packed show full of variety of tricks: juggling, manipulation, audience participation and impressive balancing. He finishes by precariously balancing on top of a dangerous and seemingly impossible stack of pipes and rolls. 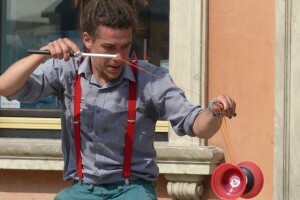 His dad Damian Gordon who was with us in 2006 so we are happy to see a new generation of buskers joining us this year! Armed with a suitcase full of surprises and a wacky sense of humour – Mr Qwirk will leave you dumbfounded, and asking yourself… what just happened? He has been performing professionally since 2001 and now returns to BuskerBus after many years. 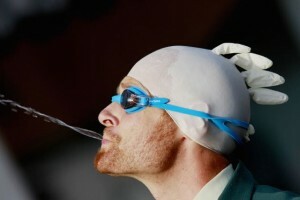 A Persiflage about the Olympic Games of Modern Times! Top-Performance Sports and Medal-Gravid Comedy! Mike & Mike running for Gold! Turn on, tune in and freak out! Website: http://www.philip.fairweather.astroeuros.com/index.php?menue=about Philip Fairweather is an actor and singer from Exeter in England, but currently living in Wroclaw. 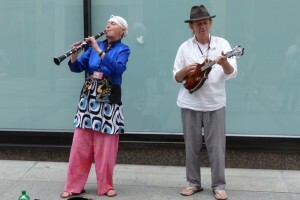 A veteran street performer, he first began busking aged 14 in 1986 as a “saturday job”. In 1995, he took it up full time and toured over 20 countries in Europe. Philip first became involved with BuskerBus in 1999 and has been to every festival since. 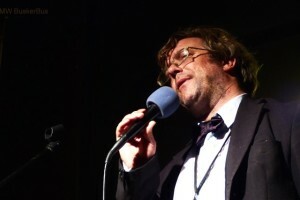 From 2009, he has hosted and coordinated the BuskerBus Cabaret on each evening of the festival. This duo doesn’t need an introduction. Ruach amazes audience with traditional Jewish music (Klezmer) at festivals all around the Europe. Dorothea Hegeduess playing clarinet and Boguslaw Hegeduess playing both giutar and mandolin introduce us to musical identity of the Europe. Professional break dance crew from Hungary.Their show is a combination od dance, acrobatics and humour. They have performed in many countries but they are BuskerBus debutants. 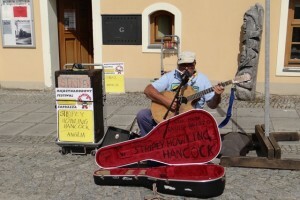 For more than thirty years Stripey Howling Hancock, aka Nigel, has entertained a grateful public with his unique blend of Ragtime, Celtic and Country styles, spiced with the folk traditions of Eastern Europe and more than a touch of humour. Sylvain presents a show high in energy. He performed at BuskerBus 2015 and won over the public in Krotoszyn by reading a children book Martynka in Polish. He will amaze you with his juggling and unicycle skills. But more than this, he is an artist of the unexpected, speaking strange language and inviting volunteers to take part of the show. Just come watch, giggle and enjoy the atmosphere of this uncommon show. The magician Antonio Labella, also known as Tonny Walker Black Label, will surprise you with modern and classical magic numbers with originals touches of humor. From his agile hands appears and disappears various object. He demonstrates skills developed through years of practice and thousands of shows performed around the world. 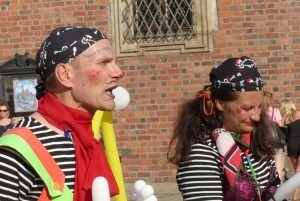 The Swedish circus duo Trattofon consists of Marija Meded (former civic engineer) and Jerry Lasota (part-time teacher). They will present a show for children called Akropanik. Two characters are impatiently waiting to have a show. In the meantime they get bored, stressed out, jealous and hungry. The show is 30 minutes long, mute, but with music and contains physical comedy, acrobatics and Charleston dance. Evgeny spent his childhood in the theatre. His father Igor Fokin, founder of the street puppet theatre “Wooden Horse Puppet Theatre”, taught him how to work marionettes when he was a small kid. When he was seven he debuted on the street helping his dad with shows in Sankt-Petersburg, Russia. After his father’s death he decided to continue a family tradition. He also studied music. 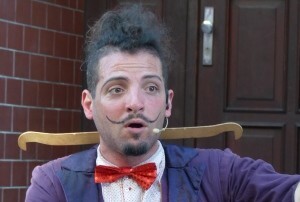 At BuskerBus Evgeny will present a magic story of puppet Doo-Doo and his friends. 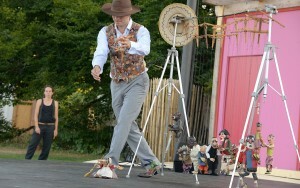 Marionettes dance, sings, make acrobatic tricks, and communicate with audience.